As the 600+ students involved in last week’s Orientation—either as new students or student leaders—can attest, enthusiasm for the new school year is running high. Classes begin today, September 2, and members of the Class of 2015 will wear their academic robes for the first time. The semester is ceremonially opened in the afternoon at Convocation, held in Diana Chapman Walsh Alumnae Hall Auditorium, with remarks from the president, provost, and student government representatives. That gathering is following by Stepsinging in the outdoor Hay Amphitheater. While to those who’ve been away, the College may seem to have just woken up from a summer nap, the campus has seen a lot of activity since the last academic year came to a close with Commencement. Here are some of the highlights. WSTC’s production of Noël Coward’s play Hay Fever, directed by Marta Rainer ’98, enjoyed a strong opening on May 29, and ran through June 22 in the Ruth Nagel Jones Theatre. The comedy of manners follows a family through a summer weekend at their English country home with a motley assortment of guests who ended up fleeing the madness as the family’s behavior becomes increasingly outrageous. Wellesley alumnae from class years ending in 9 or 4, with attendees from the Class of 1939 through the Class of 2009, celebrated reunions at Wellesley during the first weekend of June. And in a memorable moment during Reunion 2014, Madeleine K. Albright ’59—sporting Wellesley Blue sneakers to help deliver her message—introduced the Wellesley Athletics Hall of Fame and announced its inaugural class of inductees. Another former U.S. secretary of state who came to reunion, Hillary Rodham Clinton ’69, was interviewed by CBS. Countless miles were logged round Lake Waban by walkers, joggers, and dogs; in bicycle rides across campus; and laps swum in the pool over the last few months. For many faculty and staff, it kicked off with Wellesley’s Healthy You Walking Challenge, in which teams of Fitbit-wearing workers compiled steps in an eight-week competition. The pilot program inspired 500 community members to participate and was so successful it will be repeated. Guests enjoyed several exhibitions at the Davis through July 20, including Tony Matelli: New Gravity; Guido van der Werve: Nummer veertien, home; and "Like a Great Roman Ruin": The College Hall Fire and Anne Whitney at 100. In addition, Read My Pins, a unique traveling exhibition organized by the Museum of Arts and Design in New York, ran June 9 through July 20, featuring more than 200 pins from the collection of former Secretary of State Madeleine Albright ’59. Many of these pins were donned to communicate a message or a mood during her diplomatic tenure. On June 16, Albright and Wellesley President H. Kim Bottomly presented a public talk about the collection. Science and social science research was in full swing in labs and libraries on campus through August 1. On July 31, the student participants of Wellesley’s Summer Research Program presented their research to faculty, friends, and the community with presentation posters in the Science Center Library. Wellesley hosted the two-week Composers Conference and Chamber Music Workshops, an annual event with a dual purpose: to further the potential of emerging, young composers and to develop the talent of amateur chamber musicians through instruction with nationally-renowned faculty. Both provide opportunities for performance, to the delight of audiences who enjoy the free performances of the participating musicians. Visitors and campus denizens enjoyed the beauties of the Botanic Gardens throughout the summer while indoors, staff members started the many seedlings that would become First Year Plants. As the spring semester drew to a close, the work on Schneider was completed, and during the week of June 11, many student service offices—class deans, registrar, student financial services, etc.—began moving into the newly finished space. Thanks to decades of careful maintenance, the Field House basketball court floor was sold and will have a new life at a basketball center in Kentucky. Meanwhile renovations continued on the Field House, with cranes deployed to move roof segments. Work was also completed on a utility tunnel services the Hazard Quad residence halls. This will allow for better water pressure and similar amenities as well as enough power to support upcoming renovations in that part of campus. Most recently, the first phase of construction on Founders and Green halls has been completed, with state-of-the art new classrooms and more unified office space for some departments. We had a little fun exploring it with a video riffing on an HGTV favorite. 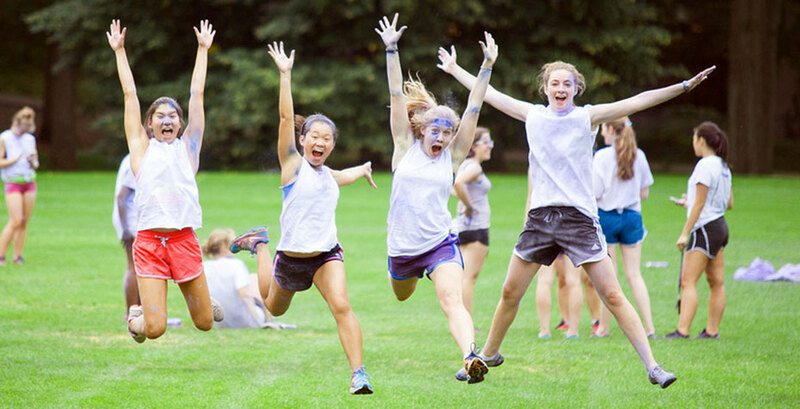 Finally, just before the full complement of the campus population returned, first years and new transfer students from all over the world came to Wellesley to get acclimated. Student leaders had prepared thoroughly for their arrival and an impressive agenda of events shared information and built bonds among participants and their families. Move-In Day was gloriously sunny (and not hideously hot) and got Orientation smoothly underway. It ended with its Color Me Purple Fun Run in which runners and walkers who participated were daubed with purple-colored cornstarch tossed at them by Orientation leaders at strategic locations. Bringing new meaning to “show your colors” for the purple class of 2018. Welcome back to school, everyone.